Let’s get something out of the way first thing: while writing may be an art, getting paid for your words is all business. As an author, you have a commodity to sell—your novel—and the only means readily available to you is direct mail marketing, in the form of a query letter. The publishing business is a food chain. You feed your manuscript to an agent, who in turn feeds it to an editor, who then pays you for the work, minus the 15% agent’s fee. The editor carries your flag through the halls of the publishing house, trying to convince the marketing department and the other staffers to rally behind your work. If everyone in the chain performs well, your book is reasonably successful; but if anyone fumbles the ball, everyone loses, and no one but your Aunt Betty will ever see the fruits of your imagination. If it sounds like a high-stakes game, it is, and that’s why everyone moves so cautiously. But how to you get an even shot? The magic portal to the inner sanctum of publishing is the query letter. Assuming that your book is well plotted and paced, that it has believable characters, that it is free of spelling errors, that the dialogue rings true, that you have formatted it properly, and that it is built on a marketable premise, your book—like any good, worthwhile product—will eventually sell. But let’s be reasonable. When Ed McMahon sends you his annual invitation to buy magazines, he doesn’t count on you to buy a subscription. In fact, he assumes that for every hundred letters he sends out, maybe two or three people will buy. Such are the rules of direct mail marketing. Why, then, should you expect better returns on your far less scientific campaign? Breaking into publishing is one goal for which the law of large numbers applies. Too many writers get discouraged after three rejections and start to gut their manuscripts. Relax. Take a long view on this book selling thing. If the product is good, it will sell. If it doesn’t, then that doesn’t really matter, because by the time you finally give up, your next book will be ready to send! I’m a big believer in research. In the world of marketing, it’s not enough to know about your product; you also have to know about the industry and the consumer—and at this stage of the game, the only consumers you care about are literary agents. Go to the library and read every book they have on agenting. Once you know what an average literary agent endures every day, you’ll have new respect for the jobs they do. Let’s assume now that you understand your product and you understand your market. It’s time to develop your mailing list. My favorite literary agent reference is Writer’s Digest Guide to Literary Agents. Buy a copy and read every single entry. Highlight the agents that represent books similar to yours, and cross out the ones that are definitely not a good match. Next, go back to the beginning, and develop a list of agents (a hundred or so to start) to whom you wish to mail your query and synopsis. I only sent ten letters at a time (five to the A-List and 5 to the B-List), because I had a full-time day-job, and I knew there were limits to how many letters I could manage and track at one time. Besides, I tweaked each new iteration of the letter as I went along, and tracked which versions brought boilerplate responses, and which ones brought more personalized notes. Remember, not all rejections are equal. Of the 27 I collected for Nathan’s Run, the prize winner for tackiest rejection was a New York B-Lister who sent back my own letter bearing a stamp—you know, one of those things you pound onto the ink pad before you pound it onto the paper—that read, “No.” I mean, really. Could we possibly get more impersonal? How much effort does it take to draw a two letter word, for heaven’s sake? Made me want to write a four-letter word back to her (plus a three-letter one, lest the verb languish without a subject). Something to keep in mind as you’re flooding the postal system with letters: you get exactly one shot per project with each agency. If you mail too many letters at once in a format that doesn’t work, you’ve blown that many opportunities for a favorable response. After reading your entry in The Writer’s Digest Guide to Literary Agents, and noting your interest in mainstream fiction, I’d like you to consider representing my new novel. Nathan’s Run is the story of a twelve-year-old who is unfairly caught up in the juvenile justice system. When he is attacked by a drunken guard, he defends himself and escapes, triggering a series of events that polarizes public opinion while capturing the hearts of the world. He’s frightened and he’s alone. And someone is trying to kill him. The story is drawn from my experience as chairman of a citizen’s committee overseeing the Juvenile Detention Center near my home, and from my years dealing with disadvantaged children as part of the Big Brother program. My non-fiction work has been published in a half-dozen trade journals, and I have participated in several writers’ workshops, including two years of study with the Writers-in-Residence at the College of William and Mary in Virginia. I’ve included a synopsis of Nathan’s Run, along with the first three chapters of the completed manuscript. Please feel free to call me with any comments or questions, either at my office, [number], or at my home, [number]. I look forward to hearing from you. In your opening paragraph, tell the prospective buyer (the agent) why you chose him. Show him that you’ve taken time to research the type of books he likes to represent. It never hurts to borrow one of the books he’s repped in the past from the library and give it a quick skim. If you do, mention that in the letter as well. For example, you might open with, “After reading your entry in The Writer’s Digest Guide to Literary Agents, and noting your acknowledgment by Harvey Schwartz in his book, Worms …” Never turn your back on an opportunity to rise above the slush pile. Your synopsis will tell the story in much greater detail, so don’t steal your own thunder by telling too much of the story here. The query is merely the cover letter that will entice the buyer to read further. You’ll note that Ed McMahon’s cover letter only tells you about the ten million dollars. The details are saved for the rest of the package. I’m going to go out on a limb and guess that Tom Clancy and John Grisham don’t have to include this part of the query, which answers the unasked question, “Why should I care about to what you have to say?” Those guys could sell their laundry lists for a million dollars. Unfortunately, the rest of us have to prove ourselves. If you have experience in a field related to your fiction, spotlight it. If you don’t, still try to make some kind of connection between yourself and your writing. Use your imagination, but always be truthful. Only a fool would lie to his agent. I have a theory on buying anything: Never be the first in line. When an auto maker comes out with a new design, I always wait a year or two for them to work out the bugs before I’ll consider putting my money on the line. I figure that if I were an agent, I’d rather have someone else teach a promising new writer the basics of the craft. The query letter is your opportunity to put your potential buyer’s mind at ease. Without presenting a tedious resume, it helps to show some kind of credentials. Notice the reference to the completed manuscript. As a veteran of a dozen or more writer’s conferences, I’ve learned that a frightening percentage of agent-seekers haven’t yet finished their manuscript. It’s a little like buying gas before you have a tank to put it in. Write this down: create first, sell later. Also, not every agent is going to want to see sample chapters at the query stage, so be careful. In your closing, be sure to tell your buyer what you want him to do—in sales parlance, be sure to ask for the order, and give him the mechanism with which to do it. An agent friend of mine told me that a surprising percentage of queries arrive in his office without a phone number! What’s he supposed to do if he loves the idea? It’s no secret that the odds are stacked against every new writer. Sometimes it seems hopeless, but as bad as the odds are, at least they’re even for everyone, and people just like you defy them every day. The trick is to get that first shot—to be heard above the din. For good or ill, the query package is your only voice. Sign up for updates and my newsletter! 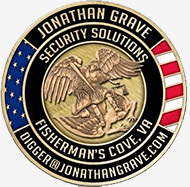 Want a Jonathan Grave Challenge Coin? Find out here how you can get your coin.